This month for Cottage Cooking Club, I made two more enticing recipes. This is a cook-along group for Hugh Fearnley-Whittingstall´s “River Cottage Veg”, started in May 2014 by the talented German blogger, Andrea, of Kitchen Lioness. Collectively, this group is making all the recipes in this book in one year. That means the goal is for all the recipes in the book to be cooked by some member of the group, but not for each member to cook every recipe. It’s fun, and much less intense than the multi-year project of French Fridays with Dorie. 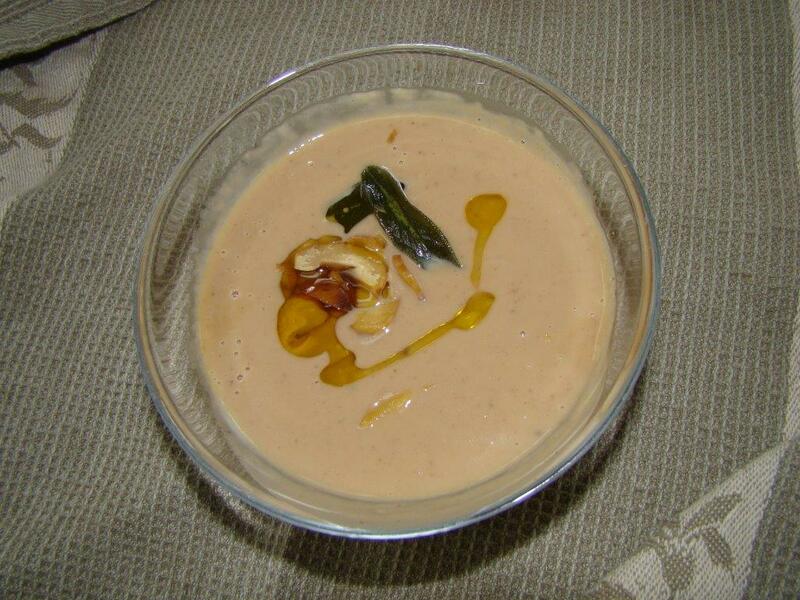 The first recipe I made was the chestnut and sage soup. I adore chestnuts. I always add them to my Thanksgiving stuffing. Years ago, I used to roast and peel them myself. What a pain! More recently, they are readily available, already cooked and peeled, in jars or bags. While one might argue these aren’t quite as tasty, they are certainly more convenient. The convenience translates into more frequent appearances in my kitchen. I also adore soup. In the fall and winter, I typically make a pot of soup every week that we can enjoy for lunch. I repeat “old favorites”, but I’m always excited to try new recipes. With the precooked chestnuts, this soup was simple to prepare. First, chopped onions get sautéed before adding garlic and sage. Then, the chestnuts and stock are added and simmered until the flavors meld. Finally, the mixture is pureed until smooth. Each bowl of soup is garnished with chopped chestnuts, fried sage leaves and a drizzle of the oil used for frying the sage. The soup worked well for lunch, but if served in smaller cups, it would make an elegant starter. The chestnut and sage soup received high marks at my house. I’ll be making it again. If you want to try it, the recipe can be found on-line here. The other recipe I tried was Patatas Bravas. This is a Spanish tapas dish consisting of fried potatoes topped with a spicy tomato sauce. 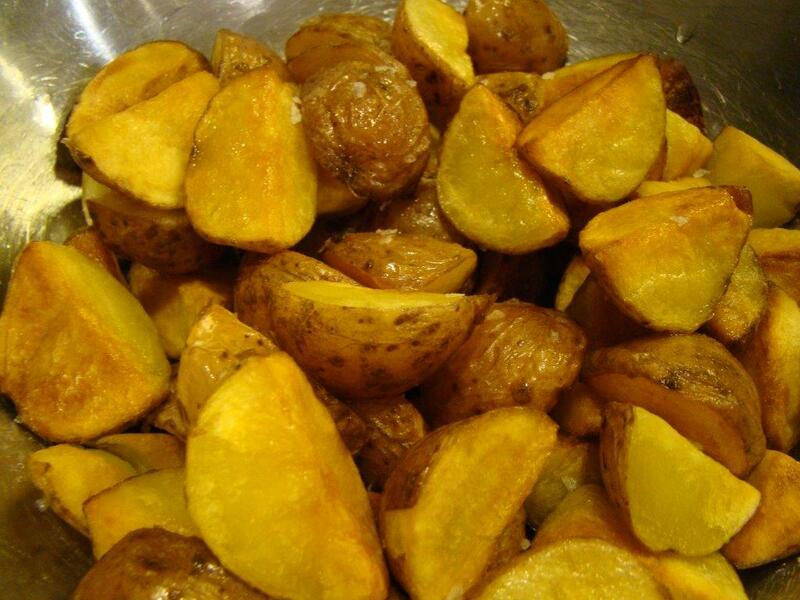 The potatoes were first parboiled in salt water before frying them in oil. Wow! The potatoes were super crispy. The tomato sauce was not all that spicy, but did have some kick. I followed the directions and tossed the potatoes with tomato sauce before serving. Unfortunately, I found that once covered in sauce, while the flavors were good, the potatoes lost their fabulous crunch. When I’ve ordered patatas bravas in a tapas restaurant, it typically comes with aioli too. Next time, I will serve the potatoes with the tomato sauce AND aioli on the side for dipping each crispy bite. 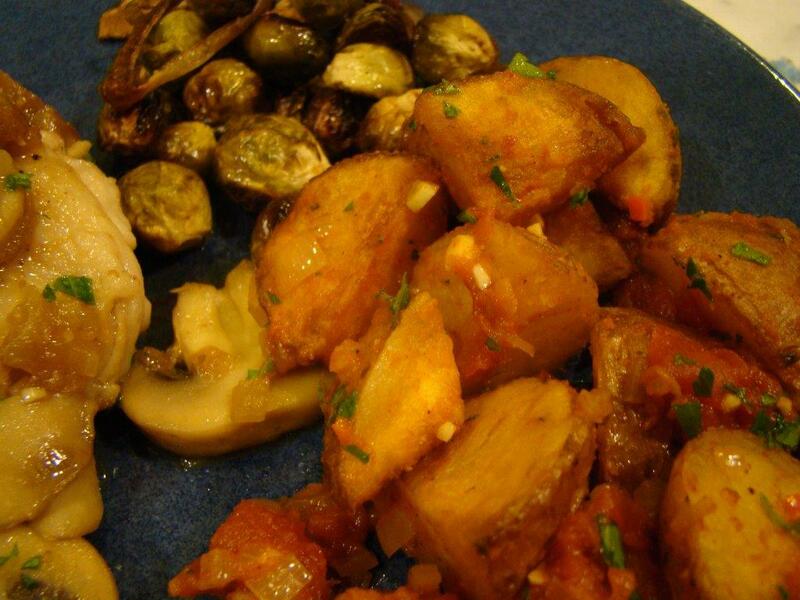 I served the potatoes as a side dish to accompany roasted chicken thighs with a mushroom-sherry sauce (to keep with the Spanish theme) and roasted Brussels sprouts with shallots, which was among last month’s CCC choices. It would be fun to plan a meal to share these potatoes along with other tapas dishes with friends for a more traditional spread. I had some of the spicy tomato sauce leftover, which I used as a base for the sauce I used to top storzapretis (Corsican ricotta dumplings) that I made last week. I’m looking forward to trying a few more recipes next month. River Cottage Veg is filled with simple recipes that combine vegetables with new seasonings or other vegetables, resulting in instant “new favorites” to add to my kitchen’s repertoire. Since I don’t have time to make them all, it’s also fun to read the recipes reviews from the other participants and be inspired about what to try next. Posted on 25 November 2014, in Autumn, Cottage Cooking Club, Soup and tagged chestnuts, Cottage Cooking Club, potatoes, soup, tapas. Bookmark the permalink. 8 Comments. Hi Betsey, I almost picked the chestnut soup, have never tasted chestnuts before, yours looks delicious! The potatoes sound wonderful as well, great tip about adding the sauce later. Happy Holidays to you! Your choices look great! We enjoyed the soup as well. I so agree with you about the chestnuts being a pain to peel! Next time, packaged precooked chestnuts!!! The patatas bravas was a favorite – the sauce was delish! Dear Betsy, we certainly agree on the velvety and amazing taste of the Chestnut and Sage Soup – what a delectable treat indeed – you are absolutely right, it would be perfect for serving to guests as an elegant appetizer. The Patatas Bravas were also a hug hit – I agree that it might be a good idea to serve the slightly spicy tomato sauce on the side. And the Roasted Brussels Sprouts with Shallots have made a regular appearance at our house already – aren´t they wonderful as the roasting brings out the sweet side of this veg. I like that member get a bit creative with their choices and pick up some recipes from previous line-ups! Thank you for participating again this month, dear friend – I certainly appreciate it. Hi Betsy, you made the chestnut soup sound lovely enough for me to give it a try. Outside of one little hot meat off a stand in New York each year which I find quite rich, I’ve never given much thought to cooking with this nut. It seems a lot of the girls made the Patatas Bravas and so I think I will also give it a go over this month. Thanks for the wonderful update. I made the patatas too. I agree, the sauce changed the texture, maybe “on the side” next time. I love that about this group, too. There are plenty of recipes that I’ve got bookmarked to try, just because of the stellar reviews by other CCC participants. The soup was my favourite of everything I tried this month. I know that roasting and peeling is best, but I love the convenience of vacuum-packed chestnuts, too. You’re completely right about the potatoes. I wanted to like them with only the spicy tomato sauce, but they would have been so much better if there was an aoli too.